Each year, the marketing landscape changes in many subtle ways and in a few not so subtle. This past year was no different. New technologies, new tools, new strategies and new tactics have emerged and some of them have become mainstream overnight. So, with all of the changes, how is a marketer to know what to do and what not to do. The “batch-and-blast” method of email marketing is old, worn-out, not very effective, and frankly, it’s annoying. So don’t do it. Get smart by segmenting your list and sending extremely relevant communications to small, targeted lists. Sure, it’s a little more work, but you’ll see much better response. You’ll stop ticking people off. You’ll reduce opt-outs. And conversions will increase. The most effective way to segment (without doing extensive surveying of your list) is by behavior. Track when people open your emails, click on particular links, attend webinars, visit certain pages of your site, and more. With this behavioral profile of your customers you can determine their interests. You can communicate with them on a very personal and relevant manner. And most importantly, you can do it en masse in the same way that you do one-on-one. An observation I’ve made is that big businesses tend to communicate to their customers in a very corporate, dry style. And small businesses, in an effort to not appear small, and to look and feel legitimate, tend to communicate in a more corporate style. Personal connection is lacking in most of the marketing communication out there. I recommend that you be a bit more authentic, that you open kimono a bit more, be more raw and unpolished. People want to connect with people, not businesses. I recently ran into a company that does this well. Saddleback Leather Company sells high-end leather bags. I’m a pretty conservative guy when it comes to my finances. Ok, I’ll open kimono and tell the truth. I’m a bit of a tight wad. But, after browsing the Saddleback Leather Company website, I found myself telling my wife that I’d really like one of these bags. Their marketing is raw, brilliant, and it creates a personal connection. One tip for doing this is to keep one customer in mind when you write. Write for that one person as if you were writing directly to him or her. If you write with that style, instead of writing for the larger group of all of your customers, you’ll create the personal connection you need. I fear that the Internet is creating lazy marketers. The recent social media craze, along with the fact that empowered consumers now control the sales process more than the vendors do, have created a mentality of “build it and they will come”. So, businesses launch their websites, create content and share it, and expect sales to just come rolling in. The inbound marketing approach is now the first step in the sales process, but it falls short as a complete strategy. Sales skill is still required. Persuasive copywriting and sales is a necessary element for converting the traffic that your inbound efforts create. I’ve always loved the Zig Ziglar quote, “Timid sales people have skinny children”. True. Video is a mechanism that can create personal connections very quickly. And for many people, it’s the preferred way to learn. Luckily creating quality video inexpensively is easier now than it’s ever been. I recently helped a client of mine that is a dentist launch a video campaign to targeted segments of his customers. One segment we identified is a group of Canadian customers that come to Arizona in the winter. They pay on time. They don’t complain. They’re happy customers. So, we created a video campaign specifically for them. Here’s a simple, somewhat corny, but very effective video we created for them. We shot and edited this video on my iPhone. Now, tell me that wasn’t easy. The mobile market is exploding. You can’t ignore it any longer. If you do any kind of direct mail or outdoor advertising, you should consider using QR codes. What about text messaging? Give your customers the option of requesting more information, coupons, or bonus offers if they text in your keyword to a short code. Luckily, American Idol has taught millions of people how to vote (or request info) via text. Smartphones are getting more powerful by the day and users are using them more and more. You’re missing out on opportunity if your customers can’t engage with your company on their phone when the time is right. If your social media marketing strategy involves reaching a certain number of followers or friends, you’re focusing on the wrong things. Social media marketing is a traffic source. As a marketing effort, social media should be measured the same as other marketing efforts. So, measuring traffic, leads, and customers from social media efforts keeps you more focused on the right things. If you’re using social media for customer loyalty, it should be measured in with similar metrics to other customer loyalty efforts. Does it improve satisfaction scores? Does it reduce calls to your support team? However you decide to use social media, just make sure you’re measuring the right metrics. Don’t let anyone convince you that the ROI of social media is untrackable. Everything is trackable these days. Clearly this is the antithesis of my first “Do”, but it’s important enough to call out again. Email marketing has recently been under attack. It is still the undisputed leader in cost-effective conversion marketing. Email is still the “inner sanctum”. If you had to choose between a list of 1,000 people that opted in to your email marketing or 1,000 Twitter followers, you’d choose the email opt-ins all day long. Treat those valuable prospects the right way. Don’t blast them with your promos. Send targeted emails that create value in the relationship. Everything is trackable these days. You shouldn’t settle for doing anything without full visibility into the metrics. You can now track all of your offline efforts as well as your online efforts. Marketing still requires a bit of guesswork and a lot of testing. But, because of the tracking that is now available to you, you should be able to know what’s working and what’s not working within very short time frames. Technologies that are available today allow us to stay in touch with our customers like never before. We have email autoresponders, social media, direct mail, voice broadcast, mobile apps, text messaging, and more. But that doesn’t mean we can hammer our customers with sales messages. Think of your relationship with your customers as a savings account. A general rule of thumb is to make 4-5 deposits before making a withdrawal. Make sure your sales pitches or promotions are less than 25 percent of your communications and that your other communications are building the balance in your bank account by creating value for your customers. 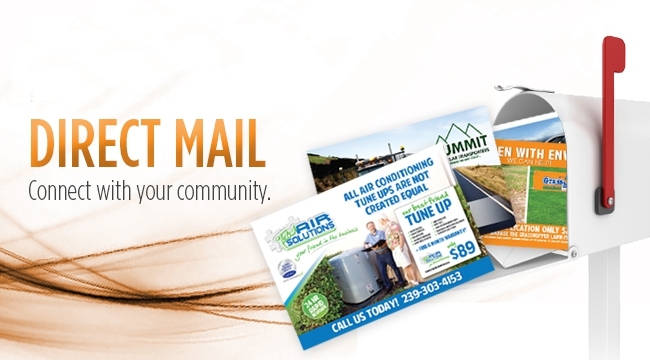 Direct mail, when utilized within an online marketing campaign can reinforce your message and further the connection you have with your customers. Because of the cost, many marketers are reduced the amount of direct mail they send. This gives you an opportunity to stand out. If you’re following my first suggestion to segment by behavior, you can ensure that you’re only sending direct mail to people who have responded to your marketing efforts. This ensures that you’re investing in the customers that are most likely to continue buying from you. Please don’t buy an email list. If you didn’t build the list on your own and you haven’t obtained explicit permission from your list to email them, then it’s not cool to email them. Sure, there are plenty of people who will send you “opt-in” email lists. And according to the CAN-SPAM law of 2003, it’s ok to buy a list and email them. But, you’ll get a bunch of spam complaints. The response will be abysmal. And, you’ll contribute to the decline of email effectiveness by filling more people’s inboxes with irrelevant messages. I’ve talked to many small businesses that believe they are “online” because they have a website. Remember, build it and they will NOT come. Throwing a static brochure online and no one will know. It’s like a tree falling in the forest that no one hears. You need to drive some traffic to your site. One of the most cost-effective ways to do that is to blog about topics important to your target market. The search engines love sites that are actively adding valuable content. So, learn some basic SEO principles and turn your static site into a thriving sales machine. In a simple list of do’s and don’ts, I can’t cover every possible topic, but based on my experience, these are a few of the things that can propel your marketing efforts moving forward.